Yuna: "I Don't Try To Hide My Sense Of Self"
In a sea of flash-in-the-pan female pop stars with too much skin to show and too little talent to back it up, Malaysian artiste Yuna shines like a gem. The 27-year-old is putting Malaysia and South-East Asia on the world map ever since her US EP Decorate debuted in 2011 under FADER Label. Two EPs and one full-length album later, Yuna is back with her sophomore full-length effort Nocturnal, the first under Verve Music Records. Renowned musician David Foster heads creative operations at the record label; he promised fans to “keep an eye out for Yuna in 2013”. Her Pharrell-produced hit single “Live Your Life” made waves in the indie music scene and a successful US tour with VEVO Lift artiste Graffiti6 shaped her career pre-Verve. Now, Nocturnal has landed her in some pretty sweet places. She recently performed single Rescue for Jimmy Kimmel and Conan O’Brien’s late night talkshows. As a testament to Yuna’s rising stardom, she spent 68 weeks at the Billboard Uncharted chart, peaking at #2. The chart launched in 2011 as a way to track emerging artists who have not yet debuted on another Billboard chart but have received popularity to online media. That demographic is where Yuna excels best: Live Your Life’s music videos have a combined 2.3 million views and her video for I Wanna Go, off her second EP Sixth Street, has crossed 1.1 million views on YouTube. Of course, Yuna’s success is the result of much hard work on her end in the online Malaysian market. Only after uploading her songs to Myspace and releasing two EPs in the Malaysian market did she get noticed in the US market. She has not forgotten her roots: her third Malaysian album Terukir Di Bintang was released four months before her first US album, to critical acclaim. 20 awards later, Yuna still is the carefree spirit with lyrics that speak towards intangibles and a dress sense which proves that conservatism is in no way dowdy-looking. Her humble disposition and down-to-earth persona are symbiotic to her feel-good songs and uplifting melodies. With Nocturnal debuting at #23 on the Billboard Heatseekers’ Album chart, it only marks the beginning of a great career for this young starlet. She takes over the Esplanade Concert Hall for a one-night-only performance on Feb 24 and we are delighted to welcome her to Singapore. 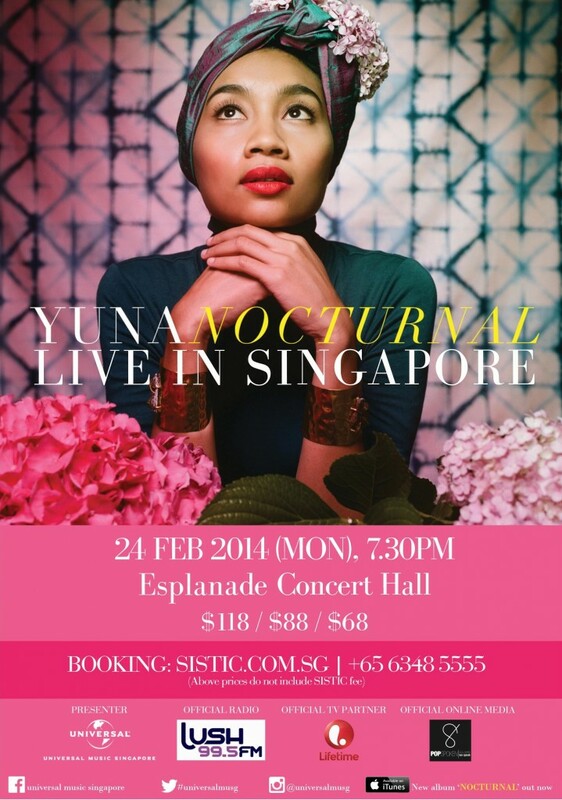 Popspoken is proud to be the official online media for Yuna ‘Nocturnal’ Live In Singapore.